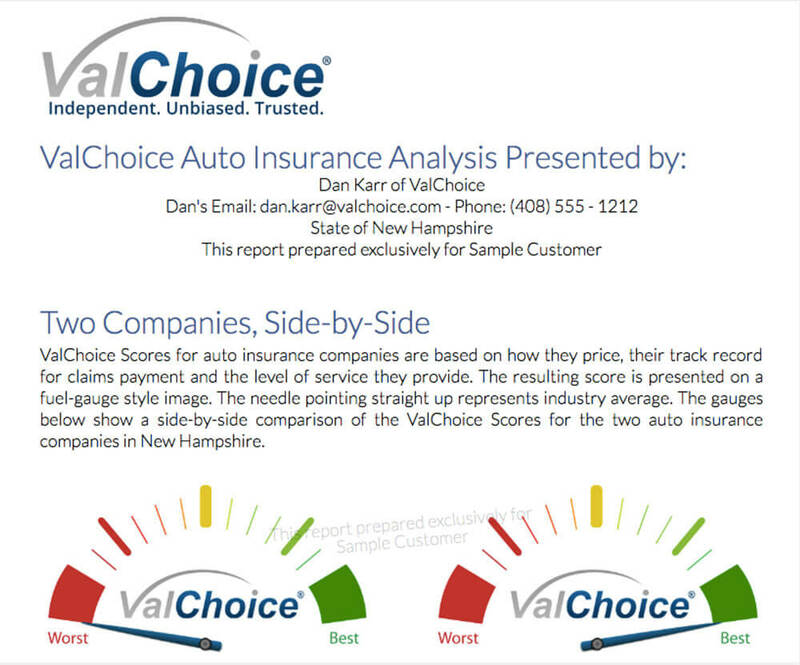 Example ValChoice auto insurance report card. This is a real example report. The decision to buy insurance should involve far more than just the price! ValChoice Agent Tools help you: increase retention rate, get you found on the web, get more customer referrals by providing transparency. By connecting consumers with the best insurance companies, agents and agencies, ValChoice is changing the way people shop for insurance. Embrace the new way and grow your business by choosing the plan that is best for you from the table below. Your screen is too narrow to view this table. If you’re using a mobile device please try Landscape View. Buy a full year and save up to 20%. Get found on the web by consumers shopping for insurance. This is the only agent directory focused on helping shoppers find agents offering high quality and a good value. Generate custom reports for clients in less than a minute. No training required. Retain or gain two customers, easily done in first week or two, and the tools will have paid for themselves for the first year. Show customers what a great decision they made buying good quality insurance and stop losing customers. Become the preferred agent in your area by offering shoppers unbiased, independent, quantitative analysis on both companies you represent and those you don’t. You choose which companies on which to run reports. You see the report first. If you like it, send it to the customer. Reports include agency logo, agency name, your name, phone number and email address. If you like the report you ran, the click of a button sends it to the client. Unlimited reports for customers and prospects enables you to win and keep more customers than was previously possible. Receive leads from insurance shoppers shopping for quality insurance. Receive high-quality leads that only go to you or your agency. Get a beautifully designed webpage portraying yourself and your agency. This high profile web page appears in local listings, getting you found in more places on the web. The best tool available for expanding your sales with existing customers. In addition to the ValChoice Score, show clients how good any insurance company is in the categories of Value, Claims Handling and Service. Get high-quality blog content to share on social media and on your web page. Supercharge your social media presence with automatic generation of content that attracts customers. Automatically send clients an updated report before their policy expires (optional). Agency owners use the tools to perform competitive analysis on carriers they compete against and companies they are considering representing. Use our independent data to change the dynamics of your next negotiation with carriers. Carriers pay for agents to use these tools to roll a book of business. Make sure your team builds loyalty and increases conversion rate immediately with personalized training on how to most effectively use ValChoice Tools. Ideal for multi-site agencies and direct-to-consumer sales.